No time to go to a yoga class? No problem! You can adapt many of the familiar yoga poses that you've learned in class in a way that makes them easy to do at home. 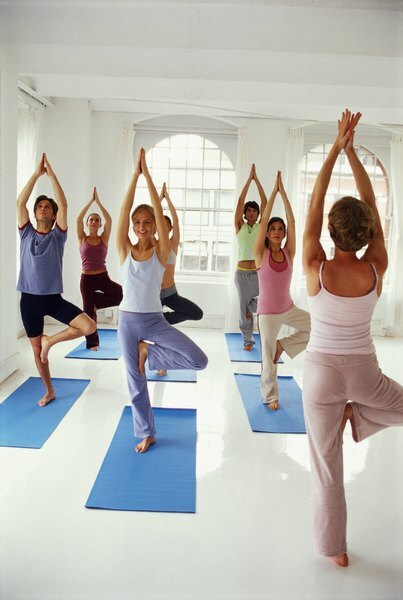 Hatha yoga activities can energize, relax and restore you at home any time. Balance exercises on one leg are an important aspect of Hatha yoga; they strengthen your legs and teach you to focus. When you're on the phone, balance on one foot and lift the other foot to rest on your supporting knee or thigh. Fix your gaze on one point to help you balance. This is part of the Tree pose. In class, you'd place your hands together in Prayer pose, or hold them over your head, but the "Phone Tree" will still improve balance and strength. Do it on both sides for an equal time and breathe naturally. For more of a challenge, practice part of the Eagle pose: both legs bent, one wrapped around the other. Some of the best Hatha yoga exercises for stretching hamstrings and strengthening quads and glutes are the Warrior series. These exercises also strengthen ankles and feet, back muscles and shoulders, and improve balance. Do a modified Warrior III by holding on to the kitchen counter with both hands, stepping back a couple of feet, lifting one leg straight in back and lowering your torso so you make a straight horizontal line with the upraised leg. Look at a spot on the floor to keep your neck straight. Breathe naturally as you hold for several seconds or as long as you're comfortable. Do this on both sides. On days when your balance is very steady, let go of the counter, stretch your arms forward and place your palms together. For a further challenge, drop your back leg and go into a lunge position, raising your palms to the ceiling in Warrior I pose. When you take a break from kid wrangling and fixing up the house and watch television for a few minutes, use that time to also stretch your obliques, shoulders, back and neck. Many Hatha yoga poses can be adapted for a seated position; one of the most effective is the Spinal Twist. Come into a cross-legged position and place your right hand on the outside of your left knee. Reach back with your left hand to the sofa back and get a good grip. Sit up straight, breathe in, then breathe out as you twist your whole body toward the left. Hold for a few seconds, then release and come back forward. Repeat to the right. Follow with the Wind-Relieving pose: With both feet on the floor, squeeze one knee at a time to your chest, breathing in on the lift and out on the release; this exercise releases tension in the lower back and helps digestion. Be safe. When doing balance exercises, always have a counter or sturdy chair nearby in case you lose your balance. Be determined. Challenge yourself to do Bikram's Half Moon pose every time you stand up, or three deep, diaphragmatic breaths every time you sit down. And have fun -- Hatha yoga isn't meant to be dreary; enjoy the feeling of stretching and feeling renewed energy with every exercise.